That's us done for the second day of rowing at this year's Henley Royal Regatta, although racing will continue until 7.40pm this evening. Join us tomorrow for more racing, results, reaction and photos from the water. In the meantime, catch up on the highlights and reaction from Thursday with our live blog below. Team GB rower Sholto Carnegie powered to victory in his first race of this year's regatta after he and partner Rob Hurn beat the pair from 1884 boat club in the Silver Goblets & Nickalls' Challenge Cup. The Yale graduate, racing for Leander, won by two and a quarter lengths in seven minutes and 36 seconds. Carnegie said: "It was a good race. It's always hard in your first race because you don't know what the conditions are going to be like but it's good to get any pre-race nerves out of the way. "We executed our start well and it's a good way to transition in to tomorrow's race, with a few things we can learn from." A composite crew of Leander and Cambridge University beat Columbia University, USA, in the Visitors' Challenge Cup. The crew were comfortable throughout and beat their American counterparts by three and a quarter lengths in six minutes and 59 seconds. David Bewicke-Copley, who sits in the bow seat, said: "It was a good race and we are looking forward to the next one." Upper Thames Rowing Club were eliminated from the Wyfold Challenge Cup after losing to Australia's Upper Yarra Rowing Club, despite holding a lead of one length at the barrier. The crew built an early lead following a fast start and looked on course for victory after passing Fawley with a three-quarters of a length advantage. But a late burst from Upper Yarra saw them draw level by the hole in the wall and take the lead seconds after, eventually winning by a length in six minutes and 53 seconds. 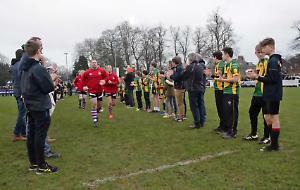 Upper Thames coach Toby Mottram said: "I'm obviously very disappointed. Clearly Upper Yarra are a very seasoned club with a lot of experience in this race as previous winners. "We went off strong and had probably the best first half of the race we could have hoped for. At the end of the day the better came out on top and we wish them the best of luck for tomorrow." That's all the local action this side of the tea break, which starts at 4.30pm. Racing resumes at 5.30pm and two more crews from the Henley area are still to compete. Upper Thames will be pitted against Australia's Upper Yarra in the Wyfold Challenge Cup at 5.50pm while a Leander and Cambridge University composite will face Columbia University, USA in the Visitors' Challenge Cup at 6.15pm. A Henley Rowing Club "B" junior boys' quad were narrowly defeated by Westminster School in their heat of the Fawley Challenge Cup. Their rivals won by three-quarters of a length in seven minutes and one second. Like many crews competing today, the Henley crew reported choppier conditions on the water than yesterday. Ed Roy, 16, of Riverside, Henley, said: "I'm pretty proud and thought it was a good row for us. We knew Westminster were going to be quick but we kept pretty close to them. It was quite bumpy out there - we had an easier race during the early part of yesterday but there were lots of pleasure boats out today. "However, we handled it alright and in a few years' time we'll be even better. We did well and I have absolutely no regrets." Sunny weather isn't always a given in England but we've been basking in glorious heat all week. Now members of the Stewards' Enclosure have been told they may remove their jackets for the rest of the day, which should add to the summery atmosphere of the occasion. Ties and cravats must remain on as usual. A crew from Henley's Upper Thames Rowing Club were defeated by Leander in their heat of the Visitors' Challenge Cup. They struggled with their steering as the race got under way, first drifting into the buoys on the outside of the course then veering back towards the centre before getting back on course. Their rivals had established a clear lead by this point and it was always going to be a struggle to catch them up, which they were unable to do. Leander won by two-and-a-quarter lengths in seven minutes and 14 seconds and reached the barrier in one minute and 53 seconds, equalling the record set by Isis Rowing Club in 1998. Upper Thames' Jim Burkitt, of Greys Road, Henley, a former Leander rower, said: "It was really enjoyable. It was hard but we came into this race just to have a bit of fun as four guys together for a local club. We're chuffed to have made it into the regatta. "The weather was hot but we didn't notice it much and it's nice to row in the heat as we do so much in the cold and wind for the rest of the year." James Stanhope, 23, who sat at stroke in the Leander boat, said: "It was really washy out there and pretty horrible. I didn't really look up from my seat and my eyes were firmly fixed down until the barrier. We were a bit side-to-side off the start and tomorrow we'll need to be a bit cleaner. "We made the call to bring our strike rate down at the barrier and continued reducing it until the end. We've got a tough race tomorrow so today is a good start but we'll need to keep up the effort." 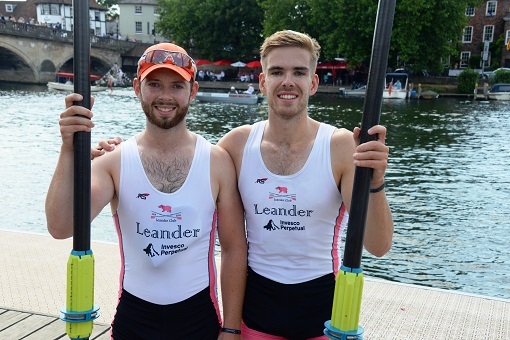 A Leander pair of Harry Glenister and George Rossiter then won in the Nickalls Challenge Cup and Silver Goblets against their club's own "B" crew of Ed Fisher and Jonny Jackson. Glennister and Rossiter had the upper hand early on and slowly increased their lead as the race progressed, winning by a length in seven minutes and 22 seconds. Harry, 23, said: "We had a really good start and executed our plan as intended. It was very, very bouncy out there and we were struggling to balance the boat but it was fun racing and the crowd was great. We were trying to conserve energy and not sprint in towards the end." Henley's "A" crew dominated the race from the outset, establishing a two-length lead at an early stage and staying ahead until the end. Despite a valiant efforts from their rivals, a "D" crew from Latymer Upper School, the Henley girls won by one-and-a-half lengths, in a time of seven minutes and 53 seconds, before going straight back to their clubhouse. Let's hope this sets the pattern for their next races. A tense, nail-biting race in the Princess Elizabeth Challenge Cup between a Shiplake College eight and Brunswick School, USA. Both got off to a strong start and Shiplake initially appeared to have a slight lead before their rivals caught them up and at one point were ahead by about a length. However, Shiplake redoubled their efforts and took the lead in the second half, which they had increased to three-quarters of a length by the time they finished. They won in a time of six minutes and 32 seconds. An emotional rollercoaster for both the boys and their supporters - and a thoroughly well-earned triumph. Cox Jacob Kirby, 16, told our reporter on the scene: "We went off as fast as we usually do at the start and thought Brunswick were either insanely fast or front-loading the race. We then started coming back slowly and began to believe we could do it. "Brunswick almost got clear but we did our best not to let them and managed to stay with them as we passed Upper Thames Rowing Club. They'd clearly gone out too hard. "It's the kind of race you dream about and we were very relieved with the result. You could hear the roar from the grandstand and everyone wanted us to win." Hugh Mackworth-Praed, the college's first VIII coach, followed his crew's progress from the Thames towpath. He said: "I was watching at the barrier when they went past a length down. Cycling along the riverbank, I could see about 200m further up where they still had a canvas overlap on us. "The next thing I heard, our boys were half a length and then three-quarters of a length up. It was very mature racing from them. We knew they had the ability but that wasn't quite the way we planned to beat them. "Only two of the crew had raced at Henley before but they are all very switched on and self-motivated. I was a little concerned when they went past the barrier but as soon as I heard they'd come back and we were half a length up I knew that was fine." They will face the winner of the race between Pangbourne College and Radley College at 3.30pm. Last year Shiplake lost to Radley in the semi-finals. Hugh added: "It would be nice to get even with Radley after last year. They got silver at this year's National Schools Regatta and we got bronze so the boys are motivated." Jacob said: "We're confident-ish about tomorrow and definitely learned a lot from today's race which we will take forward." Well we've broken for luncheon at day two of Henley Royal Regatta, which makes it a perfect time not only to catch up on the morning's action - see below - but also read some of the other colour and detail our reporters have written about different aspects of this much-loved event and the crews and characters that are involved with it. Here's a selection of related stories which we've put live this morning. Tony Bailes, head boys' coach, commended his crews performance. He said: "Claires Court are a young J16 crew but they are still bigger and heavier then us but technically we rowed a really good race and were nice and relaxed. He said they were looking forward to tomorrow's quarter-final when they face Maidenhead Rowing Club, who beat Leander Club's Star and Arrow crew earlier today. Tony added: "Maidenhead are one of the favourites but I think it'll be an interesting and high quality race. We would like to upset them." Jamie Kirkwood, of Leander Club, won his heat against against G Suursild from Kingston Rowing Club easily in the Diamond Challenge Sculls. He said: "I'm really really happy - I had a good first half and then settled into the second half and tried to enjoy it. "The water is always bouncy at Henley and it's particularly bad when you're in a single." Jamie will be racing against former Great Britain team mate and former Leander sculler Charles Cousins tomorrow (Friday). He added: "I've got a big showdown tomorrow. He used to be the fastest heavyweight and I was the fastest lightweight. It's going to be a fun race." The Leander Club and Upper Thames Rowing Club composite were beaten by Edinburgh University and Oxford Brookes by one length in six minutes and 44 seconds. James Scott, 26, who represents Upper Thames, said the crew had only been together for two-and-a-half weeks. He said: "They went out very hard, as did we. We actually had a really good start, up until the barrier was really good and was probably the best we have done so far. "From the barrier to Fawley we had got into our rhythm but were caught out by a bit of wash and they held their rhythm better through that. "From then on it was really quite hard to push back and they were slightly more polished than we were." He added: "The result is disappointing but as we are so recently formed, and have been inconsistent since then, to have a good row on race day was really pleasing. We are to happy to have been in contention in the early part of the race and the defeat was only by one length." Meanwhile, Leander Club beat Monmouth Comprehensive School easily in a time of seven minutes and five seconds. Crew member Jo Willis, 16, said: "We knew they were going to give us a race off the start and we went along with it and pushed on." He added: "We are very pleased with the win and tomorrow should be interesting. Our aim is to win the event and as a crew we are feeling good." Leander Club beat Itchen Imperial Rowing Club by two and a quarter lengths in a time of six minutes and 43 seconds in the Thames Challenge Cup. Crew member Tom Wiblin, 19, said: "I thought it was a good race - the only way to describe it would be 'job done'. We did what we needed to do. "We had a good start, got off well, and didn't let them come back. It is a good building block for tomorrow. We have had two races now of a similar standard but obviously it is going to get harder. "I was pleased with the manner of out victory but credit to Itchen Imperial, they also had a good race, but the focus was for us to pace ourselves and get the victory." With our team standing by to get you all the news, results, reaction and photos direct from the river this morning as it happens, now seems a good time to look back at how yesterday's racing went, in case you missed it. As our coverage explains, day one was one of highs and lows for various local crews, who had mixed fortunes on the sunniest opening day of Henley Royal Regatta in recent memory. Despite the sweltering conditions, the crowds and competitors were able to keep their cool during Wednesday's heats, while local cafes and restaurants have ordered extra food to cover expected increased demand from visitors. SO here we are on day two of this year’s Henley Royal Regatta. Thursday will see the next round of some events while others have their first races. The Britannia, Visitors’, Goblets, Diamond Sculls, Diamond Sculls, Diamond Jubilee and Prince of Wales contests all begin today. Leander Club will race in the Thames Cup against Itchen Imperial Rowing Club at 8.35am. A composite crew comprising athletes from Leander Club and Upper Thames Rowing Club face an Edinburgh University and Oxford Brookes crew in the Prince of Wales Challenge Cup at 10.05am. Leander Club are in action again in the Fawley Challenge Cup against Monmouth Comprehensive School at 10.15am. 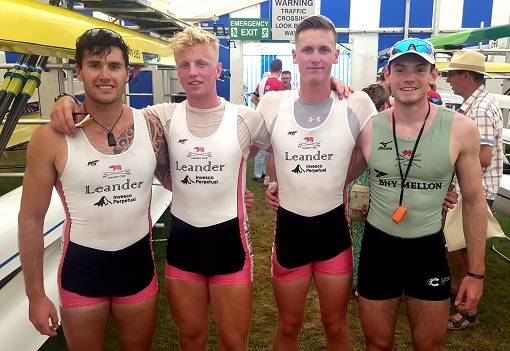 Its development crew, Star and Arrow, which comprises students from The Henley College race for the second time in this year’s Fawley Challenge Cup. They are up against Maidenhead Rowing Club at 11.10am. Henley Rowing Club’s “A” crew are also in action in the Fawley Challenge Cup and face Claires Court School at 12.10pm. This is immediately followed by a Leander Club and Army Rowing Club composite against another crew from Leander Club in the Prince of Wales Challenge Cup at 12.15am. The final race of the morning session begins at 12.20pm which is followed by the lunch interval. Racing will recommence at 2pm. Shiplake College are back in action at 2.10pm in the Princess Elizabeth Challenge Cup against Brunswick School, USA. Henley Rowing Club “A” will then face Latymer Upper School “D” in the Jubilee Challenge Cup at 2.20pm. A local clash between Leander Club and Upper Thames Rowing Club in the Visitors’ Challenge Cup follows at 3.10pm. 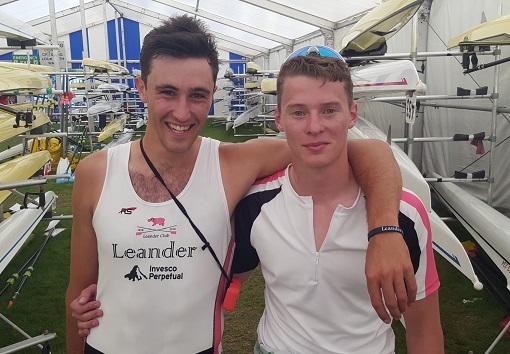 Harry Glenister, who became the first person in history to win all three quadruple scull events at Henley, is back in action for Leander in the Goblets. He is racing with George Rossiter against Fisher and Jackson at 3.15pm. Henley Rowing Club’s “B” crew then face Westminster School in the Fawley Challenge Cup at 3.45pm. The tea interval follows the 4.20pm race in the Thames Challenge Cup and racing will recommence at 5.30pm. Upper Thames Rowing Club then face Upper Yarra, Australia, in the Wyfold Challenge Cup at 5.50pm. Keep following the Henley Standard live blog for results and reaction throughout today.